The annual gathering of pharmacists was happening in Hyderabad this year. I am not a regular participant to this gathering, but decided to make it this year. A large group of my students were presenting papers at this conference, and I had a presentation too. The initial plan was to travel with my students by train to Hyderabad. As the travel date came closer, things went awry and I had to postpone my journey. An exam I had to officiate got postponed and got right into my plans. I had to let go my train ticket - and decided to look for alternatives. I preferred reaching the previous evening, so that I can be at the conference a bit fresh after catching up a bit of sleep. I got down to hunting tickets for my trip - being the beginning of a long weekend, trains were mostly sold out. The only one that had a ticket wasn't suitable for my timing. Buses were overpriced - thanks to a long weekend. The buses would drop me quite late in the city, and I wasn't very happy at that as well. I kept an STU bus leaving early in the evening as an option, and continued hunting for options. I checked flights too, which were priced at high rates. A day before my journey, I got to hunting tickets on various ticket portals and noticed that Air India was giving great last moment fares. The same fare reflected on most sites and even on the official website - I had a discount coupon for a travel portal, and applied the portal and booked the ticket through that site. The payment went through, but no ticket! After waiting about an hour, I called up the call centre of the portal, who confirmed my details and said they'd call back - they did call back in less than 30 minutes and confirmed my booking. 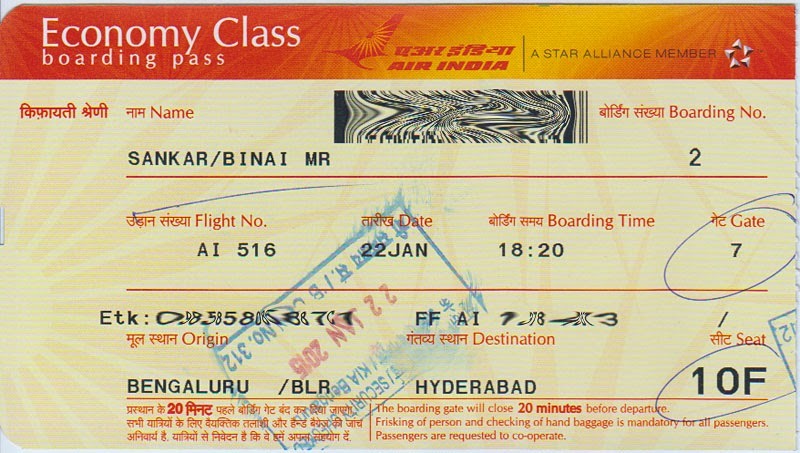 So, I had a confirmed ticket for an evening Air India flight to Hyderabad - my second A319 ride! I had to hurry a bit with the examinations and had to leave office shortly past 2pm. The clerical work associated with the examinations took quite a lot of time, and I could leave office only towards 1430hrs. There are no direct connections from our main campus to the airport - I had to change some buses to reach the airport. With time running out fast, I decided to hire a cab for a part of the journey, which dropped me at Hebbal. From there, it was a bus to the airport. I was finally at the airport shortly past 1650hrs. 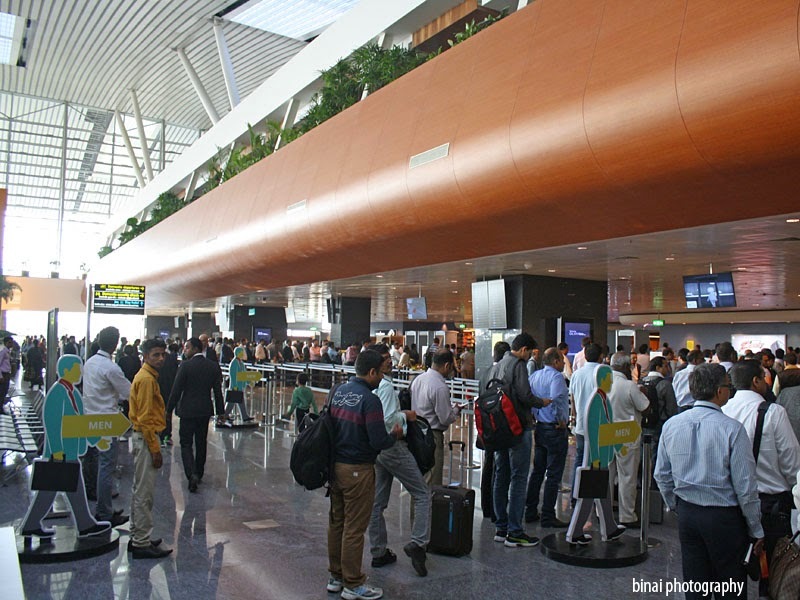 The entry gates at the terminal were crowded like never before - the long weekend ahead meant most of Bengaluru was heading out of town. It did not take much time though. Check-in was again a breeze (I had checked in online, but hadn't taken a printout) - the agent at the counter was well behaved - he spoke softly and had a nice smiling face. I had baggage to check in - which was handled quite well. Armed with the boarding pass, I headed the security check. I saw the worst ever queue at the security check - the place resembled a peak hour railway ticket booking counter in Mumbai! Long queues at every counter, and the airport guys had a tough time keeping the queue in bay. It took almost 20 minutes to pass security (the longest ever I've experienced) - there were lots of first time fliers this time, and the CISF cops had a tough time clearing them. I was finally in the security hold by 1725hrs. I was quite hungry by now, and wanted to have some light food. I thought of trying a new food outlet - Taste of India in the domestic terminal - but the items on offer did not look very inviting. I was back to the trusted Malgudi Express. I had lots of time to spend - my flight was still close to an hour away. As usual, I sat down checking FR24 and browsing the net. FR24 said my aircraft was VT-SCK, and it was flying close to an hour late! I was a bit upset with the delay. The aircraft for my flight came in at 1840hrs. The incoming flight appeared full, going by the number of passengers who walked out. Passengers deplaned very quick, and quite unusually (for AI), the aircraft was ready for the return leg very soon. Boarding was called very soon, and they called passengers by rows. Passengers seated in rows 12 to 21 were the first to be called. The agents at the gate actually enforced zone-wise boarding - they held display boards mentioning the row number while calling out passengers - they infact asked a few passengers with seats on other rows to step aside as well. Soon after most passengers for these rows had finished boarding, they opened up free-for-all boarding. I joined the queue now, and I was inside the aircraft by 1900hrs. 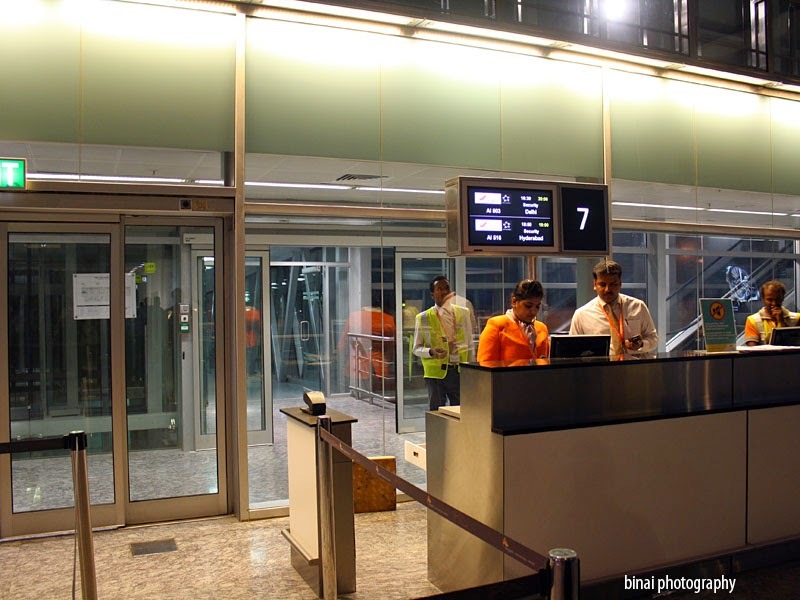 There were 4 levels of verification before I reached the aircraft - one at the gate by AI agents, then by CISF at the gate, then another one by AI agents (the counter-foil was torn here) and finally once again by an AI Security right before the aircraft door. Security Hold.. waiting for boarding to be called..
A middle aged flight attendant stood at the door welcoming passengers with the typical Namaskaar. Two more FAs were in the aisle welcoming passengers and helping them with baggage. My seat (#10F) was right on the wing. The interiors appeared very fresh and clean. The seat pockets for my seat was torn and needed some maintenance. The IFE screens were turned off - except the "Announcement in Progress" messages, nothing was displayed on the screen. Boarding was quite slow - doors were armed by 1913hrs. The aircraft was full - 100% loads. The aircraft was pushed back at 1915hrs. 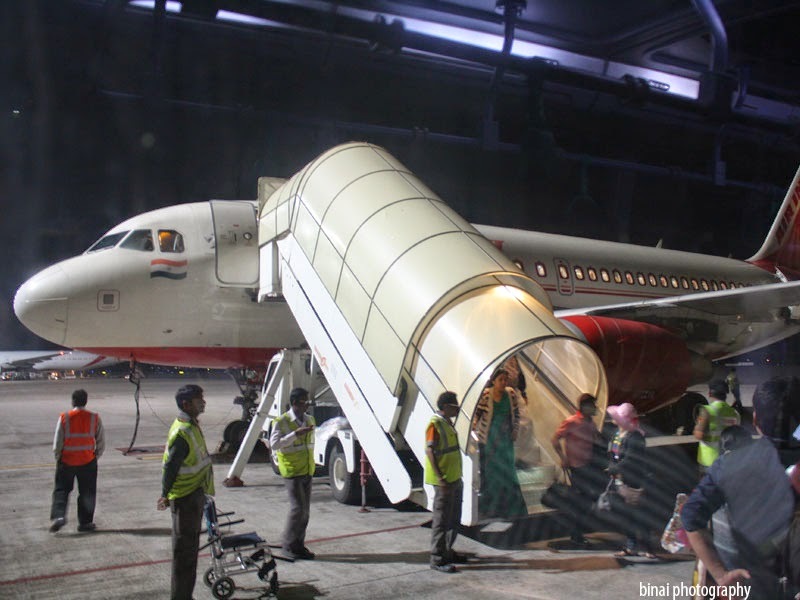 Just past push back, the purser came on the PA and welcomed all passengers to "Air India's Airbus 319 on AI516 to Hyderabad", followed by the announcement that AI is now a Star Alliance Member. She identified herself as Sunila (or Sunita) and added that the flight was commandeered by Capt NK Dutta. The safety demonstration followed. It was an actual demonstration, and not a video played on the IFE. We commenced Taxi at 1919hrs - it was a long run towards Rwy09. 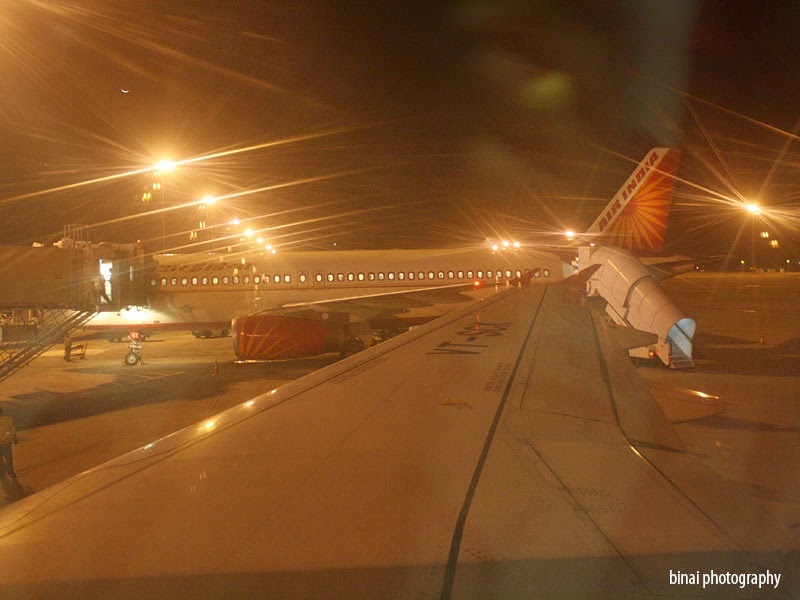 While taxiing, I spotted an Indigo A320 and an Air India A320 land. We had to hold for sometime, while a Jet Airways ATR72 landed. We were finally airborne at 1930hrs. The aircraft shook violently as we took off, and there was a lot of irritating clatter. The seatbelt sign was switched off at 1934hrs, and the in-flight service commenced immediately afterwards. Passengers were offered a snack, a water-bottle and a hot beverage. The snack contained a Cheese Sandwich and a piece of Chocolate brownie. The snack was served in an aluminum foil container, on a tray. The snack serving was followed by a round of hot beverages - I preferred Coffee as usual. The sandwich was soft, but had absolutely no vegetable in it - just a cheese spread plus a piece of lettuce. The brownie was a bit on the harder side, but tasted good. A while after the service was over, the FAs came around for clearing the trays. There were 5 attendants in the aircraft - an all female cabin crew. 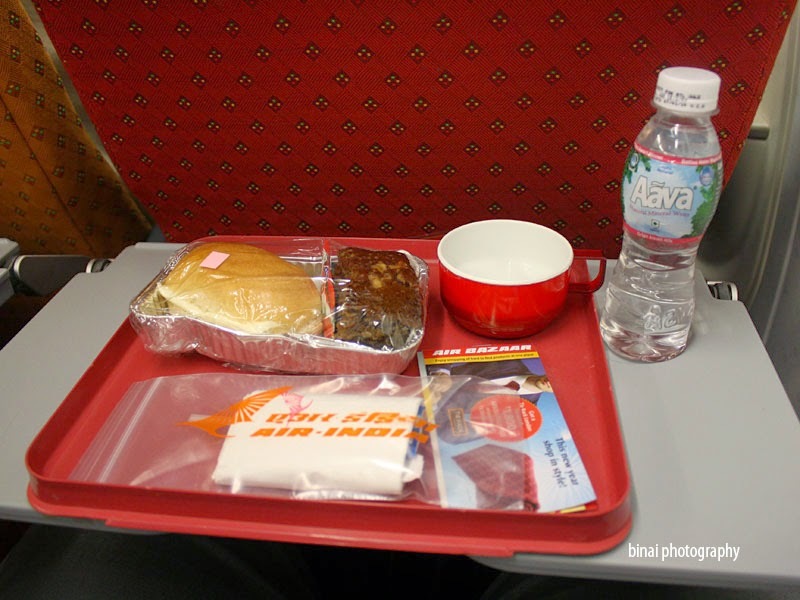 The attendant taking care of executive class (the purser) appeared quite rude - quite the typical Air India aunty style. (No offence intended). The first officer came on the PA, and gave a short description about the flight. 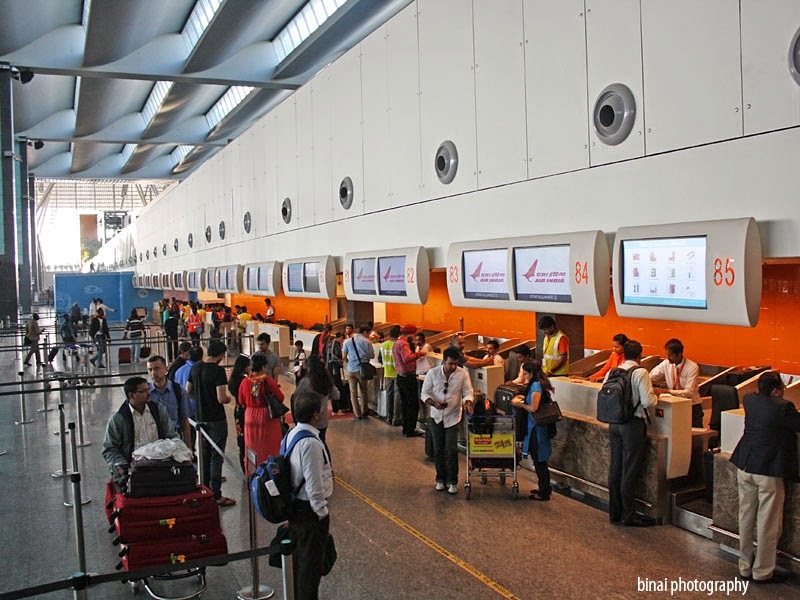 He explained that the delay in departure was due to late arrival of the incoming aircraft, which was due to some delay in Pune. He added that we were at FL330, and had already commenced descent. Shortly after his detailing, the seatbelt sign came on, and the typical landing announcement was made (2003hrs). By now lights were visible below. After the landing announcement was made, the FAs came around to check if the cabin was prepared for landing. The guy sitting on the aisle seat of my row had his tray table open. The purser came to the seat with a rude angry face - I was really afraid if she would hit him. She made a stern request to close the tray table - did not feel that approach was right. As we closed into the airport, the aircraft performed a beautiful right banking to align to the landing path. We finally touched down on Rwy09R at 2013hrs. After exiting the runway, we had a very long taxi to the apron - an Indigo A320 and an Air Costa E-Jet were preparing to taxi out. After a longish taxi, we finally parked at Stand 59, at 2019hrs - the aircraft is parked overnight at this stand, and hence there is no jetway. Deplaning started soon later, and I got off the aircraft at 2023hrs - into a waiting tarmac bus of AI-SATS. VT-SCK.. after deplaning. 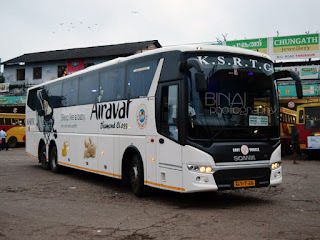 Pic taken from the tarmac bus. 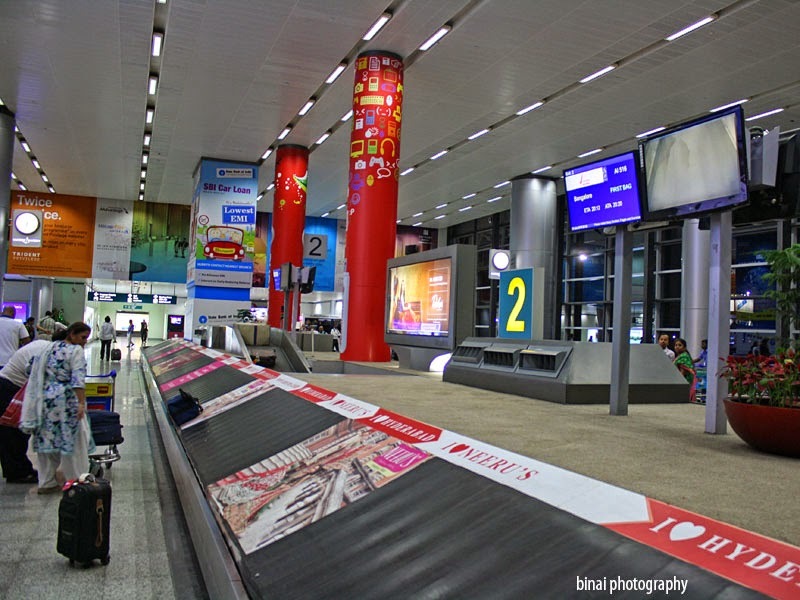 This was the first time I was entering the terminal building of Hyderabad. In my past journey, I passed through the airport. 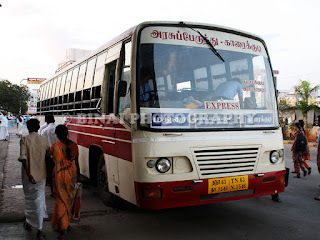 The bus had a long run to the terminal building - we were dropped near an escalator, which takes passengers to the first level - the domestic arrivals. I made a quick visit to the washroom - which looked quite outdated for new airport. 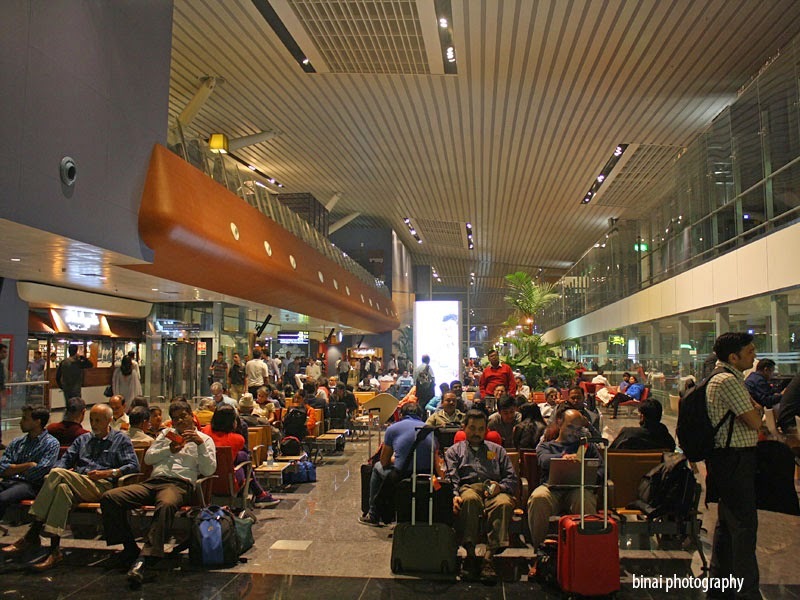 It took a long time for the baggage to arrive - my bags came only at 2040hrs. The baggage carousel was interesting - the luggage pops up from a lower level, and is dumped on to the conveyor belt - I felt this system could seriously damage fragile items in baggage. It was then a long walk to get out of the airport. It was a bit confusing layout - a long winding ramp to get to the the airport bus terminal. There were no officials at the bus terminal, and there was no sign of the bus I wanted. 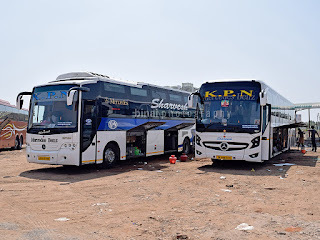 I had a very quick dinner for the food court there, and on coming back saw a bus on the route I wanted to travel on, thereby ending this part of my journey.